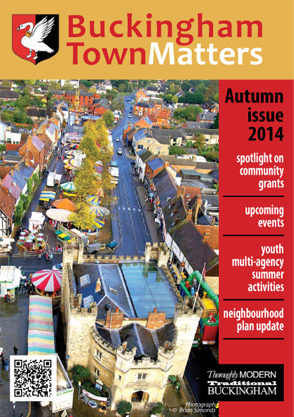 Welcome to Buckingham Town Council’s Publications page. Here you can download the Town Council’s current and past publications, including copies of the quarterly produced ‘Buckingham Town Matters’ newsletters. Downloadable versions of our quarterly council newsletter. From 2018, as well as the pdf version, we will have an audio version of our newsletter available to download. Downloadable version of our Fringe Brochures – the Fringe takes place every June/July. A selection of our other council publications. Hidden Treasures of Buckingham – You can also view our online map here, which was very kindly put together by Mr Tony Moore.